There is really little time left. Please give her a chance to receive a lung transplant. This is only remaining way to save her life. 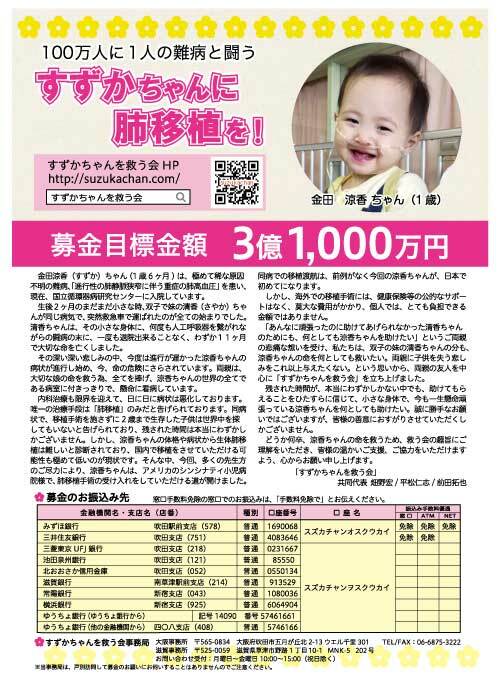 Suzu Kaneda (1 years old), has a one in a million unknown incurable disease , which is “pulmonary hypertension sever with the progress of pulmonary vein stenosis”, and is now currently admitted to the National Cardivascular Research Institute in Osaka, Japan. It all began when at only the age of two months, Saya, her twin sister was suddenly transported to the hospital with the same disease. Since then , Saya had been connected to a ventilator several times and fought hard against the disease but ended her short precious life without being able to be discharged of the hospital even once. In the moment of great sadness of losing Saya, the disease that had not been progressing so much on Suzu began to progress and is now putting her life in danger. Her parents are giving everything in order to help their precious daughter’s life. Suzu, being a twin, was inspected right after the disease was found on Saya and was diagnosed with the same disease. While being hospitalized repeatedly, she has continued her medical treatment but her condition has progressed rapidly since last November and the current treatment is coming to its limits. The pulmonary vein which is being constricted may become blocked and could cause a Pulmonary hypertension anytime, putting her life at risk. Suzu is now 1 year and 6 months old. The doctors say that “they have looked for cases around the world, but if we cannot perform a surgery for this disease, there has been no other case where the patient has survived over the age of 2”. Now, there is really little time left and she is pronounced incurable other than to take a lung transplantation. The Organ Transplant Law was revised in 2010, which enabled transplants to children/infants within Japan. However, there has only been 4 cases so far in brain death lung transplants (as of April,2016). Considering the time that is left of Suzu, the chance of getting a transplant is beyond a miracle. In the case of lung transplantation, there is also another method which is the “biological lung transplantation”. In the case of both Saya and Suzu, their parents strongly opted to use their own biological lung transplantation, but due to the limitations of the conditions and physical size of the girls, they were non-applicable. Suzu and Saya’s parents say they want to save Suzu, even more for the sake of Saya who they could not save despite her fighting hard against her disease. 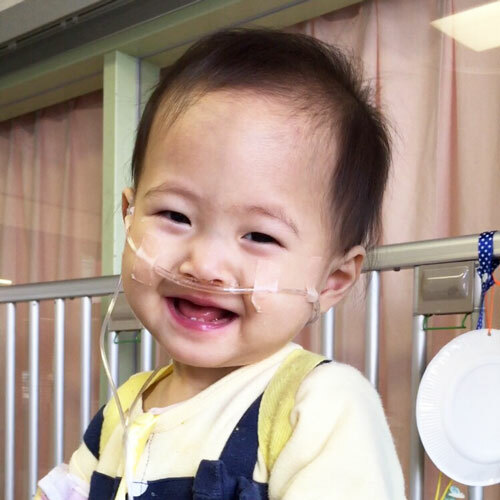 The “Save Suzu Fund” is founded to raise money to save Suzu and her parents and send them to receive a transplant in the United States. With the little remaining time she has left, we would like to be of support in all means possible to help this little fighter. Please donate and give us your kind support to help this little spirit get a new lung. Tomorrow is not promised for Suzu. Every single penny counts and every single moment matters for Suzu, so please help us and take action now. We will be thankful to all of your donations and kind thoughts.